December 19, 2016 – Lockheed Martin Commercial Launch Services has successfully launched the EchoStar XIX communications satellite. An Atlas V 431 blasted off at 12:13 p.m. MST from Space Launch Complex 41, placing EchoStar XIX in orbit for customer Hughes Network Systems, LLC (HUGHES), an EchoStar company, and marking the 139th consecutive successful Atlas launch to date. EchoStar XIX will enable HughesNet Gen5, the next generation of HughesNet satellite Internet service, delivering more speed, more data, and more advanced features for U.S. consumers and small businesses coast to coast who are unserved or underserved by terrestrial broadband Internet services. 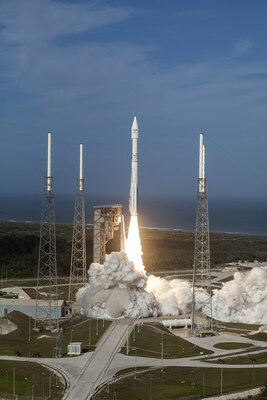 The rocket, a United Launch Alliance (ULA) Atlas V 431, was provided by Lockheed Martin Commercial Launch Services. For commercial missions, Lockheed Martin is responsible for contracts, licensing, marketing, sales and mission management of Atlas. The launch vehicle included a 4-meter extra extended payload fairing (XEPF) and three solid rocket boosters. The Atlas booster for this mission was powered by the RD AMROSS RD-180 engine, and the Centaur upper stage was powered by the Aerojet Rocketdyne RL10C engine. With an average slip date of less than two weeks and successful track record, the Atlas family of rockets provides the most reliable lift in the commercial market. Atlas also offers such precise delivery into orbit that customers can use the excess fuel to extend the life of a satellite and bringing more value to the mission. ULA’s next launch is the Atlas V SBIRS GEO-3 satellite for the U.S. Air Force. The launch is scheduled for January 19 from Space Launch Complex-41 at Cape Canaveral Air Force Station, Florida.